The Waiting © Anna Gillespie. Installation on Jamaica Street, Baltic Triangle, Liverpool. Sponsored by Castle Fine Arts Foundry. ACS artist Anna Gillespie has unveiled a new sculptural installation in the Baltic Triangle area of Liverpool, sponsored by the Castle Fine Arts Foundry. Gillespie is know for her figurative sculptures that utilise organic materials found in the wild such as acorn cups. Following recent visits to Africa and America, the artist has shifted focus away from the natural toward the man-made environment and the effect that humans have had on the planet. 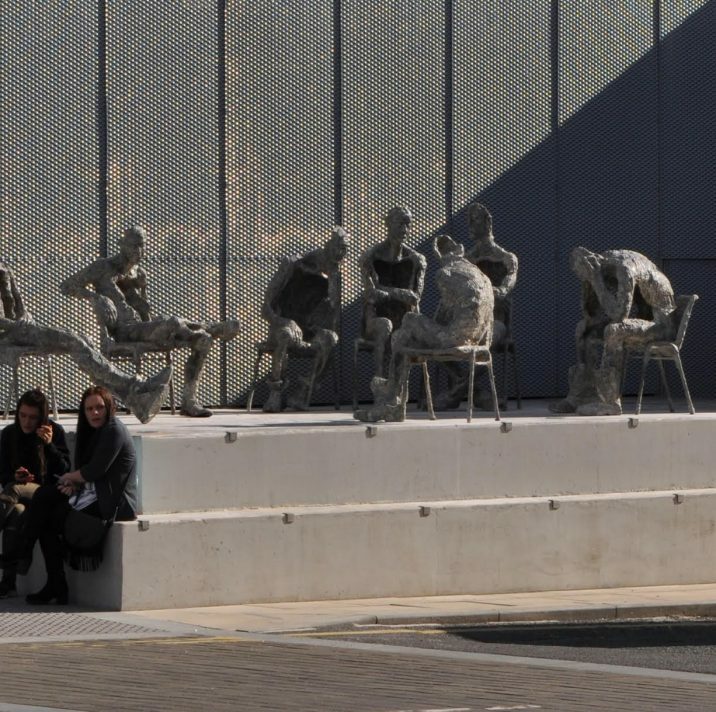 Her most recent sculpture, a group of life-sized seated figures entitled ‘The Waiting’, seeks to explore the urban human experience. The sculpture has been installed on a plinth in Jamaica Street in the Baltic Triangle area of Liverpool, the city’s cultural and creative hub close to the Castle Fine Arts Foundry where the sculpture was crafted. As with her previous work focused on the natural world, Gillespie has sourced found objects such as chairs and men’s boots to help shape the life-sized figures. Chris Butler of Castle Fine Arts Foundry has published an article on the creative process behind this unique installation. Find out more on the Castle Fine Arts Foundry blog here.